Capezio's Jr. Footlight T-Strap is a great alternative to the classic leather t-strap for dancers on a budget. 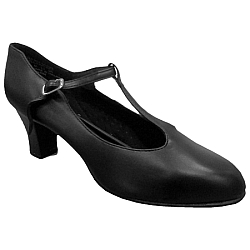 The Jr. Footlight T-Strap features all of the quality you expect from a Capezio shoe. The Capezio Jr. Footlight T-Strap has a black pleather upper to give the look of real leather, classic t-strap styling, scored genuine leather soles, metal buckles, and a 2" tall heel. Available in size 5-12.5 medium width, for best fit order your street shoe size.